Please save the date for the next Ivy Recent Graduates Happy Hour, which will be held on Friday, May 10, 2019 in Downtown Cincinnati (see the Evite that will go out the week before the event for details). The Ivy Recent Graduates Happy Hour is an excellent way to meet other Ivy recent graduates from a variety of schools, companies, neighborhoods, etc., so we hope to see you then. Please contact our Social Committee at with questions. Our next gathering promises to be another fantastic event for recent graduates, so we hope to see you there. The Ivy Recent Graduates Happy Hour held on Friday, April 12, 2019 at MidiCi was an outstanding celebration, bringing together a large group of new attendees with a stalwart group of regular happy-hour-goers for a memorable gathering. Graduates of Brown, Columbia, Cornell, Dartmouth, Harvard, Penn, Princeton and Yale enjoyed a spread of gourmet bites, delicious beverages, and delightful company in a comfortable gathering place. Click here to see photos! If you have any questions about the Cincy Ivy Club, please contact Sid D'Souza, Club Coordinator at <sid@cincyivy.org>, or visit our website. Remember, if you know new Ivy arrivals to the area, please forward this message and encourage them to join the list by visiting our site <http://www.cincyivy.org>. Award-winning journalist, entrepreneur and philanthropist Soledad O’Brien will be the next speaker for the Women's Fund of the Greater Cincinnati Foundation’s "A Conversation With…" event on Thursday, April 25, 2019, at the Cintas Center. The Cintas Center will be packed as Soledad draws from her life and career to stimulate thoughtful conversation on the roles we each play within our communities and organizations, leaving us with memorable takeaways on the power of individuals and companies to make meaningful and lasting change. General admission tickets are $50 each. Host and hostess tickets are $250 each and include a private reception with O’Brien. Visit <www.cincinnatiwomensfund.org> to purchase tickets. All proceeds benefit the Women’s Fund of the Greater Cincinnati Foundation. Contact <info@gcfdn.org> or 513-241-2880 with questions. Yale alumni, purchase your tickets for the Cincinnati Yale Club's 155th Annual Dinner featuring Patricia Russo, Executive Director of the Women's Campaign School at Yale University. Patricia Russo is a nationally recognized leader focused on improving the quality of life for women in Connecticut and the United States. For over twenty five years she has held numerous leadership positions in public, private and not for profit organizations centered on women's leadership. The Women’s Campaign School at Yale is a nonpartisan, issue neutral political campaign training program for women interested in running for public office and for women interested in campaign management. Based at Yale Law School it is a leading program attracting women from the USA and countries around the globe. There will be plenty of free parking. Tickets are $45 for Yale alumni and $25 for Yale recent graduates (Class of 2013 or later). Also, do not forget to renew your annual membership. Tickets can be purchased directly online at <https://www.eventbrite.com/e/cincinnati-yale-club-annual-dinner-tickets-59166704205>. Please contact Charlie Harte <crharte@mac.com> or Michael Hurley at <michaelbhurley@gmail.com> or 513-693-4829 with questions. Harvard alumni are invited to join the Harvard Club of Cincinnati Book Club for a discussion of "Work of Art" by Sinclair Lewis. In "Work of Art," three generations of the Weagle family grow up in and work for boarding houses, inns and hotels. The focus is on two brothers, Myron and Ora, of the second generation. Poetic, ethereal Ora could not wait to escape hotel drudgery, though never too proud to ask plodding Myron for money. Sinclair Lewis, as always, tells a great yarn, this time about the ups and downs in a rising America's unending pursuit of craftsmanship and material success. Awarded the Nobel Prize in Literature in 1930 "for his vigorous and graphic art of description and his ability to create, with wit and humor, new types of characters," his works are known for their insightful and critical views of American capitalism and materialism between the wars. He is also respected for his strong characterizations of modern working women. For information about the Book Club, contact Steve Strauss at 513-321-0967 or <sdstrauss@earthlink.net>. Harvard alumni are invited to hear Dr. Dino J. Martins, Harvard PhD in Organismic and Evolutionary Biology at the Barrows Conservation Lecture Series at the Cincinnati Zoo on Tuesday, May 7, 2019. The talk is entitled "People, Plants, and Pollinators: Lessons from the front lines of biodiversity conservation" and will include a Harvard Club of Cincinnati reception at 5:30pm followed by the lecture at 7pm. The decline in pollinators threatens our global food supply. Join us to to learn more about this cutting edge issue. Dr. Martins is currently working for the Mpala Research Centre in Kenya as Executive Director and also serves as technical advisor to the United Nations Food and Agricultural Organization (FAO) on issues relating to biodiversity, pastoralism, and subsistence agriculture. Contact Kate Molinsky <kate.molinsky@gmail.com> with questions. Constanze Stelzenmuller, an expert on German, European, and transatlantic foreign and security policy and strategy, is the inaugural Robert Bosch senior fellow in the Center on the United States and Europe at Brookings. Dr. Stelzenmuller will give a talk entitled "International Institutions Under Strain: NATO" through which audience members can gain deeper insights into foreign policy and understand how the institution's challenges can impact the everyday lives of American citizens. 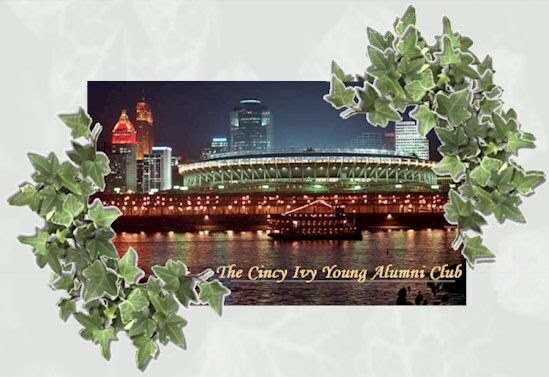 Tickets are $25 for Ivy alumni (simply enter "Cincy Ivy" in the comments section to identify your member affiliation). Visit <https://globalcincinnati.org> to read more about the event and to purchase tickets online. Contact 859.448.8984 with questions. The Cincinnati Yale Day of Service 2019 will support NAMI, the National Alliance on Mental Illness, is the nation's largest grassroots mental health organization dedicated to building better lives for the millions of Americans affected by mental illness. NAMIWalks is NAMI's largest mental health awareness and fundraising event in the country. The event hours are from 7:30 am to 2:30 pm. Yale Day of Service volunteers will help set up for the Southwest Ohio Region NAMIWalks, meet and greet, check-in/register and pass out T-shirts, and assist with site clean up. Yale Day of Service volunteers who are interested can also walk the 5k together as a team. We are asking volunteers to sign up for shifts for setup, check-in and tear down. Children who will be supervised by an adult are more than welcome too. For information and registration, please contact Jody Yetzer, LAW 1997 at <jody.yetzer@gmail.com> or 917-359-1642 or contact Michael Hurley '06 at <michaelbhurley@gmail.com> or 513-693-4829. Please join us to close out our program year on May 22, 2019! We return to the charming Camargo Club to enjoy remarks from Tim Murphy, Head Coach of the Harvard crimson football team. By any measure, Tim Murphy has led Harvard's storied football program to its most prosperous era since the early 20th century. He looks to continue that trend in 2019, as he enters his 26th season as the Thomas Stephenson Family Head Coach for Harvard Football. Murphy is Harvard's first endowed coach. Murphy was named head football coach at Harvard Dec. 6, 1993. He came from the University of Cincinnati, where that fall he had directed the Division I-A Bearcats to their finest record in 17 years. 6PM cocktails (cash bar and beverages throughout the evening), 7PM dinner and remarks. $45 HCC members, $50 guests and non-member alumni. Purchase online or mail check made to "HC of Cincinnati" to Katie Nappi, 644 Watchpoint Drive, Cincinnati OH 45230. Please include the names of any guests. Questions? Contact 2nd VP Sean Pollock <sean.pollock@wright.edu>.